In the Martin & Sylvia: Saturdays! story “Mother’s Helper,” Sylvia and Martin help take care of three-year-old Laura. They make a list of fun things to do with her. 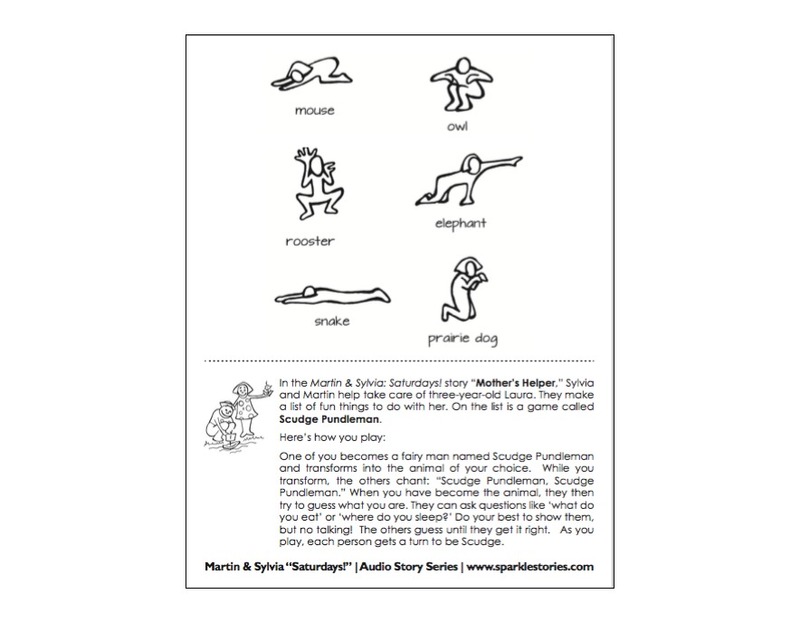 On the list is a game called Scudge Pundleman. When you have become the animal, they then try to guess what you are. They can ask questions like ‘what do you eat’ or ‘where do you sleep?’ Do your best to show them, but no talking! The others guess until they get it right. As you play, each person gets a turn to be Scudge. About Martin & Sylvia: Saturdays! Saturdays are special days for our creative brother and sister. From enormous art projects in their own backyard to "explorers" adventures up Mooseberry mountain; from mornings of quiet building along the creek, to whole-family canning adventures in the kitchen, the children find fun and inspiration at every turn. Follow along with Martin and Sylvia's family, and then visit the Sparkle Blog to find project ideas and free printables inspired by each week's story.